In a recent article by my RacinToday.com colleague Bill Fleischman, the legendary promoter Humpy Wheeler said he’d heard enough trendy names and longed for a time when drivers with colorful names like Possum Jones and Banjo Matthews showed up in starting line-ups. The driver Wheeler’s looking for might just be a young Georgian with the good ‘ol boy name of Bubba Pollard. Andrew Williams “Bubba” Pollard is the kind of person a working man, the backbone of the old core NASCAR audience, can identify with. He spends his weekdays working on his family’s trucks or baling hay, then spends his weekends racing – and winning – on tracks across the Southeast. And when his race car hits the track, he knows every bolt that has been turned on it, because he’s turned most of them himself. 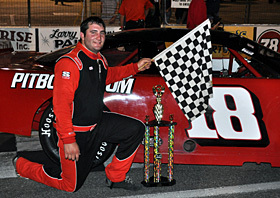 He’s a third-generation racer – his grandfather, the late Hence Pollard, was the long-time promoter of Senoia Raceway, a track built on the Pollard family farm, and his father Sonny Pollard dominated the Sportsman division races at Senoia during his driving days. But Bubba wasn’t what Jack Roush was looking for in his “Gong Show” auditions four years ago. Pollard was one of 25 selected to participate but was cut in the early rounds. Bruised by the process, he went back home and resumed his Late Model racing. In the years since his Gong Show appearance, he’s become a much more mature racer, and the results are reflecting that. So far this season he’s won 10 Late Model races at tracks across the Southeast, like Five Flags Speedway in Pensacola, Fla., Mobile International in Alabama, and South Alabama Speedway in Opp. And he’s running against some of the best drivers in that segment of the business. He attributes a good bit of his recent success to the help he’s gotten from the semi-retired Ronnie Sanders, the legendary Southeastern short tracker who has won more than 500 features in his career. “Mr. Ronnie” as Pollard calls him, is sharing his expertise and more importantly, simply being there to help make decisions about set-ups and race strategy, decisions most short trackers have to make in the heat of battle. Often, those decisions made under stress aren’t the wisest. It’s allowed Pollard to focus on his driving, and Sanders said there are few if any doing a better job out there right now. “Bubba’s really on top of his game right now,” said Sanders, who made three starts in the Sprint Cup Series over the years, all of them in the Daytona 500. If the movers and shakers in NASCAR aren’t aware of Pollard’s recent successes, it’s because he subscribes to a David Pearson-like philosophy about self promotion. Pollard, still just 22, takes heart in the fact that some of his Gong Show peers have lost their rides to more experienced drivers, and he still believes he can make it to one of NASCAR’s elite divisions. If he doesn’t, it won’t be that bad, he said. “I want to make a living in racing because I love racing,” he said. “We have fun doing it as a family and going with Mr. Ronnie, but I want to move to the next level. If he does get another shot at NASCAR, Pollard said the lessons he learned in the Gong Show will be a big help. He said his biggest concern in the test session at Martinsville was to not wreck Roush’s truck. In hindsight, he said, that may have not been the best approach. “The biggest thing was trying not to crash the truck, but looking back on it, why not?” he said. “You’ve got nothing to lose. He also said he feels better equipped today to handle the off-track duties that come with a professional racing career. “I have confidence, but I’m not at the cocky level some of the other guys are,” he said. Pollard also is willing to make a concession that would make Humpy Wheeler – and others – cringe. He’s willing to give up being Bubba if that’s what it takes to advance his career. But he also says it may be too late to do that. “Who’s going to know that Andrew Pollard won all these races and all these championships?” he said. “Is it too late to change my name?